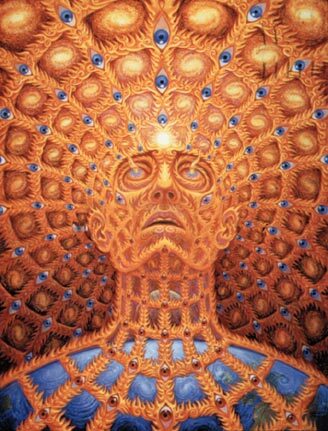 Alex Grey spent several years employed in a medical school morgue preparing cadavers and studying the human anatomy. During this period he began having a series of mystical experiences which transformed his agnostic existentialism to a radical transcendentalism. During the 1970's and 80's Grey did numerous performances and sculptural installations based on his visions. Grey's unique series of 21 life-sized paintings, the Sacred Mirrors, examine, in detail, physical and metaphysical anatomy of the individual. Begun in 1979, the series took a period of ten years to complete. After painting the Sacred Mirrors, Grey applied this multidimensional perspective to painted visions of crucial human experiences such as praying, kissing, copulating, pregnancy, birth and dying. Grey portrays the body as translucent, revealing complex anatomical systems and interwoven with glowing subtle energies visible to clairvoyants. 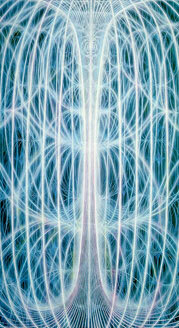 Viewers recognize in his work a glimpse into the subtle spiritual archetypal domains of awareness. Many of these works of art are reproduced in Grey's book, SACRED MIRRORS : The Visionary Art of Alex Grey, published by Inner Traditions and now available in five languages. Grey has an expansive audience outside of the traditional art world. His work has been included in the album art of such popular rock groups as Nirvana and the Beastie Boys and a book of songs by the Talking Heads. The underground Techno Rave culture has extensively sampled Grey's art, using it to promote all-night dance events. Grey's vision of the human psychic anatomy has been used by the Chairman of the Department of Alternative Medicine at the National Institute of Health in Washington, D.C. who uses it in his international slide lectures. 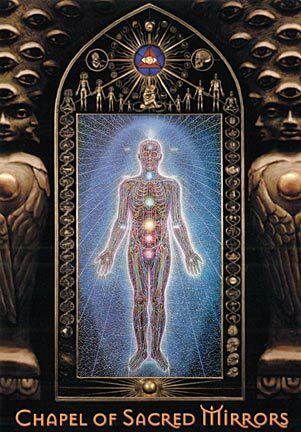 Healers, body workers and "new age" figures including Matthew Fox, Joan Borysenko and Deepak Chopra have all used his work to describe the dimensions of body, mind and spirit. Grey's artwork has been exhibited worldwide, including Stux Gallery and the New Museum in NYC, the Grand Palais in Paris, the Sao Paulo Biennial in Brazil, the Centro Culturale Zittele in Venice, Italy, University Galleries of the University of Illinois, and La Luz de Jesus Gallery in Los Angeles. A major exhibition of Grey's work was held at the San Diego Museum of Contemporary Art in the spring of 1999. Grey was featured in a television program about the brain, mind and creativity on the Discovery Channel. He has been a key note speaker at the International Transpersonal Association and numerous Art and Healing conferences. Articles and reviews about Grey's work have appeared in art journals and several spiritual and new age magazines. Grey has been an instructor in Artistic Anatomy and Figure Sculpture for nine years at New York University, and also teaches courses in Visionary Art with his artist wife at The Open Center in New York City, Naropa Institute in Boulder, Colorado and Omega Institute in Rhinebeck, New York.